cult to replicate; so this album is a tribute to over 25 years of monthly concerts in Liverpool and a celebration of the 30th Anniversary of Milapfest. This specially curated double album brings together many of the performing stars that have featured in the national concert series which has also spread to Manchester, London and other cities of England. As a connoisseur, we hope you enjoy this beautiful music, and celebrate the integration of Indian Music in the west, centred on the great music city of Liverpool. All the proceeds from the sale of this album will go towards creating new educational opportunities for young British musicians. This unique double CD features many of the amazing musicians who have appeared in the MFMS Series over the past 25 years. It is made up of specially selected tracks that feature some of the finest musicians to grace Indian Music. These tracks have been gifted on the occasion of Milapfest’s 30th anniversary. 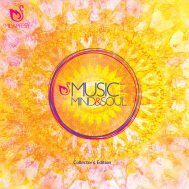 It is the kind of CD that will make a home in your heart for many years to come – this is Music for the Mind & Soul!